A prolonged war in which a nation takes part is bound to impoverish the breed, since the character of the breed depends on the men who are left. As given in David Starr Jordan, War and the Breed: The Relation of War to the Downfall of Nations (1915), 178. Cymbeline (1609, publ. 1623), Act 5, Scene 5. In Charles Knight (ed. ), The Works of William Shakspere (1868), 605. 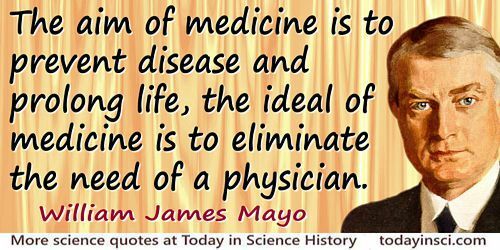 Concluding remark from address, 'The Aims and Ideals of the American Medical Association', collected in Proceedings of the 66th Annual Meeting of the National Education Association of the United States (1928), 163. In Mortimer Collins and Frances Cotton Collins, The Village Comedy (1878), Vol. 1, 56. In An Introduction to Mathematics (1911), 27.